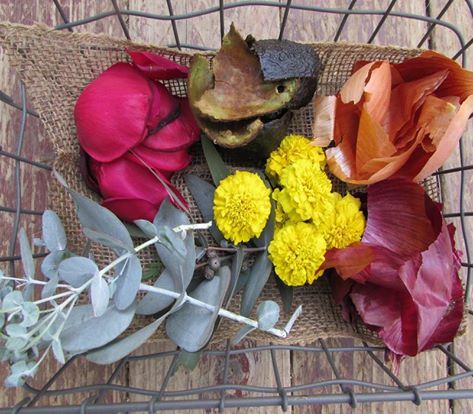 You are here: Home / Grow / Gardening with natural dye plants? Find inspiration here. Gardening with natural dye plants? Find inspiration here. This is an inspiring, and distinctive book. Every homesteader, homeschooler, crafter, gardener, educator, and fiber artist owes it to themselves to grab this book and a cup of chai and breathe deeply of the inspiration, joy, and stimulation that exudes from every page. The book is aesthetically beautiful, as if each page was dipped in a dye vat and then salted to spray the colour, like elderberry blossoms, across the page. I have another natural dye book like this, with colour splattered pages. But I couldn’t even read it because the coloured serif font blended in with the page. So when I saw the colour on the first page of this book, I cringed. But only long enough to turn the page. In this case, the choice of font and font-colour are easy to read. In fact, a pleasure to read. In fact, by the time I got to chapter 3 I was lost in the joy of it. I have to be honest, when I first opened the cover, I was expecting, yet another natural dye book, with a boring section on equipment, mordanting, and safety issues. And after that page after page of plants, that I can’t even grow in my short season, each with its own colour chart, replete with modified and mordanted colours. Isn’t that about all there is to say about natural dyes? I’ve got at least three dozen such books in my personal library – most very scientific, referenced but not read. After all, if you’ve read one natural dye book, you stop reading and start using each one like a text book, just to find the plant and colour you need this time, and the formula so that you can get it right. Forget the fact that natural dye plants and their colours are subject to the vagaries of nature – climate, soil conditions, amount of sunshine, rain, soil pH, and even the attentiveness and voice of the gardener. 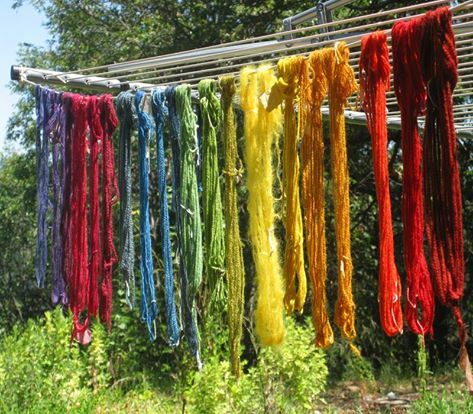 We fiber-artists expect them to behave as if they are chemicals or drugs – 5 micrograms of this and 2 grams of that and 3000 ml of H2O at a temperature of 180F for 95.2 minutes will dye 120.5 grams of 3 ply wool yarn to orange #FBBF9C or red #F25E7E. This is NOT that book. This book is meant to be read. And you’ll want to read it because, while the other books are meant to inspire a scientific craving and speak to your left brain analytical side, this book is written to speak words of delight and joy to your right brain-creative side. It is meant to get you digging in the dirt or doodling on paper while you dream of rainbows on fabric and yarn. And just to help you in your doodling and dreaming, Ms. MacLaughlin includes garden plans for a formal rose garden (Dye with roses? Yes you can! Who knew? ), a cutting garden (You mean dye plants can be used in flower arrangements? But of course. ), and even a dye garden option. So now we’ve flipped to the back of the book and started thumbing forward – isn’t that how YOU read a new book? Am I the only one? The book is written to inspire gardeners to plant dye plants and to play with plants they are already growing, in the dye kitchen. It is written by someone who loves plants and this joyful esteem really comes through. It’s contagious. Read just the introduction, and Ms. MacLaughlin’s unique voice and enthusiasm will draw you in. Chris MacLaughlin is not a master dyer. She is an experimenter – much like you and me. She isn’t going to intimidate us with long words and complicated procedures – pretending to dispel the mystery of alchemy and then obscure the secret, to all but those initiated into the mysteries. 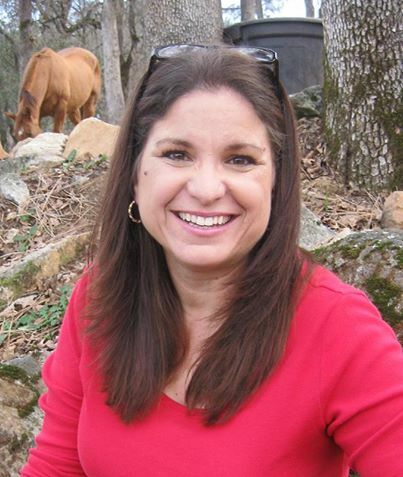 She is forthright and open and leads the reader into the thrill of discovery. Even black beans, beets, and red cabbage – known fugitive dyes – have their place in the dye pot. There is, actually, a use for the luscious red and steely blue in projects that don’t need to last 100 years. And she doesn’t just hint, there are recipes and craft projects to use those amazing but fugitive colours in the book. The book is organized, not by botanical names, thank goodness, and not by colour families, but more like a seed catalogue. The sections: fruits and vegetables, herbs, flowers, native plants and weeds, divide the natural dye plants into their unique plant categories. This gives you a hint as to where you’d like to actually place a few of these plants in your own garden. For each plant, we’re told where the colour is located – whether leaf or flower or root, as well as what general colour to expect. Each chapter lists a few dominant plants and offers some special techniques for extracting the colour – poke berries and Japanese indigo have their own sections because the techniques to achieve lasting colour are so specific. Then there is a listing of 8 other plants that you may not have thought of as dye garden candidates. The photography is amazing. The colours are intense. The plants and yarns are vibrant and alive. It’s an inspiring book and I think you’ll be eager to get started. My take away from this beautiful book, is the inspiration to try to get colour from a few plants that I’m already growing in my garden – mint, calendula, oregano, monarda, and comfrey, for instance. Maybe the naturally dyed cloth will have the same therapeutic benefit to the wearer as the herb has in a cup of tea. It makes sense that it would and regardless, my dye kitchen will smell amazing. My second take away is to dream of someday having a formal rose garden – I love even the suggestion of growing so many roses that I have enough for dyeing. I plan to include a garden bench in the centre of mine, just so I can sit and enjoy inspiring books like this one, while I breathe deeply of rose fragrance and listen to the hum of the bees. Wouldn’t it be lovely? 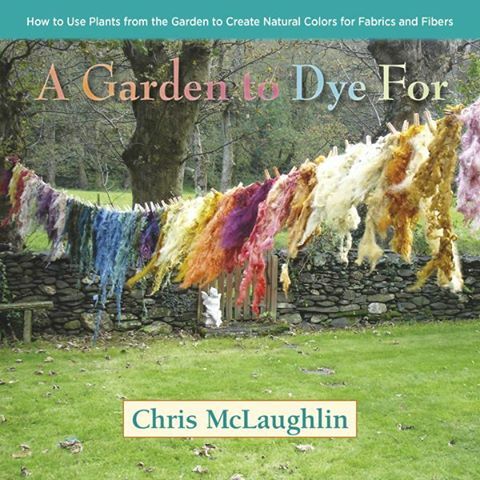 Meet homesteader, author, gardener, and natural dyer: Chris MacLaughlin! Your going to want to buy,A Garden to Dye For before you are done with the garden this year. Photo credits: All these beautiful photos are used with permission of Chris MacLaughlin and the kind people at St. Lynn’s Press. Note: Chris sent me a review copy of this book in exchange for my honest review. This is my honest review. This post contains affiliate links.